The most versatile e-bike in the fast4ward range. 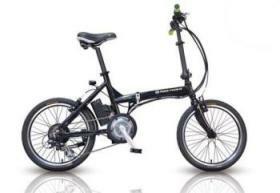 The Edge foldable e-bike weighs only 19kgs and is perfect for putting on the train, boat or in the back of a motorhome. As pleasurable to ride as it is to admire, the Edge will get you from A to B in the most efficient way. Speed/Mode:- Maximum power assistance speed ? 15.5 mph. Throttle or pedal assist. Range:- Up to 25 mile range. Lights:- Front and rear LED lights. Battery:- Panasonic advanced lithium ion battery removable for portable charging. Recharging:- 4?5 hours (plugs into a standard outlet). A2B Motor/Power:- High power 250w brushless hub motor. Gearing/Derailleur:- 7 speed Shimano derailleur. Brakes:- High quality Tektro V-brakes. Suspension:- Front suspension to absorb bumps in the road. Accessories:- Mudguards, rear rack, carry bag.